It was rather unfortunate that for a press showing to welcome four new principals to the cast, two of them were off, as was a third original member who has remained with the company. But Miss Saigon is now such a well-oiled machine that it was unimpaired; and besides, it usefully proves the point that in this case it is the show that is the star, not the actors. That’s a salutary lesson about both the fallibility of human actors as well as their inevitable dispensability. At the same time, cast changes do create interesting shifts. US newcomer Chris Peluso, taking over as Chris, brings more of an authentic preppy look to the role than his ruggedly handsome predecessor Alistair Brammer. 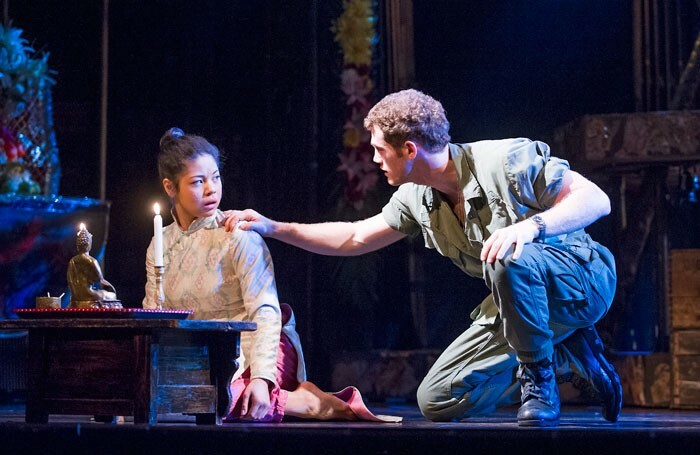 His voice has the right romantic ardour and colour, but he’s not quite as interestingly conflicted as his character quickly falls in love with Eva Noblezada’s Kim (oozing vulnerability but also determination in equal measure) and is forced apart from her in the army’s emergency evacuation of Saigon. Jon Jon Briones, Olivier-nominated in the role of the Engineer, remains a pivotal centre of the show, and it is a daringly courageous performance: a selfish thug only looking after himself, he’s deeply unlikeable yet utterly compelling as he fantasises about his own version of the American dream he hopes to escape to. I still harbour some doubts about this production’s relentless, overwhelming emphasis on spectacle over the musical’s own powerfully expressed drama, but there’s no gainsaying the incredible technical achievement of it all, or the choreographic genius of Bob Avian that threads Asian movement (including a spectacular display of back-flipping acrobatics in The Morning of the Dragon) with sleazy nightclub pole-dancing moves that supply their own narrative value.